Leaked rendered shot of the HTC Lexikon hints to it being the next DROID handset? 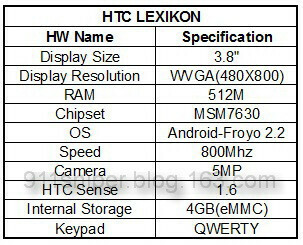 It was a little over a month ago when we first heard about the faint whisper of the HTC Lexikon which was looking to be similar in specs with the T-Mobile G2/Desire Z. 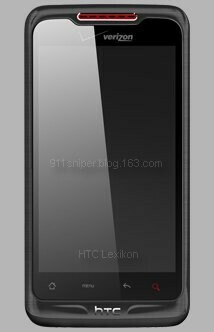 Now we're seeing a rendered shot that's believed to be the Verizon bound HTC Lexikon which further illustrates the validity that it might be the same device that we've seen over at the FCC earlier in the month. The handset is shaping up to be a mid-range offering which is speculated to feature a 3.8” WVGA touchscreen, 5-megapixel camera, full QWERTY keyboard, 800MHz processor, MSM7630 chipset, 512MB of RAM, 4GB of internal storage, HTC Sense 1.6, and Android 2.2 Froyo. The HTC Lexikon might become the latest edition to the family of DROID devices due to the red accents found with it. So far, we haven't really seen a mid-range Android handset packing a QWERTY keyboard with the DROID name plastered on it, so this might very well be it. wow, this phone looks really nice! It also has a keyboard and the processor isn't that much slower. Not real noticeably slower anyways. So basically a droid 2 with a .1" bigger screen. With 2.2 and an updated processor you don't need 1ghz, it just drains the battery. I can bet you moneyif you compared this to even the EVO, this phone will be faster and have better battery life. since the evo has 2.2 and a 1ghz processor, i doubt it. It sure isnt going to hold a candle to the GalaxyS or even a DroidX. Of course, processor speed is meaningless, because if its the same 800mhz processor thats going to be found in the G2 then its just as strong as the current snapdragon 1ghz performance wise with a much better battery life because if its new smaller die size. Dont get caught up in the numbers, look at actual performance. Haven't really seen a midrange DROID with a qwerty yet? WTF are they talking about. The moto DROID ia mid range qwerty packin android phone on verizon running 2.2.